Will Fed’s Dovish Shift Support Gold? Big win for the doves! 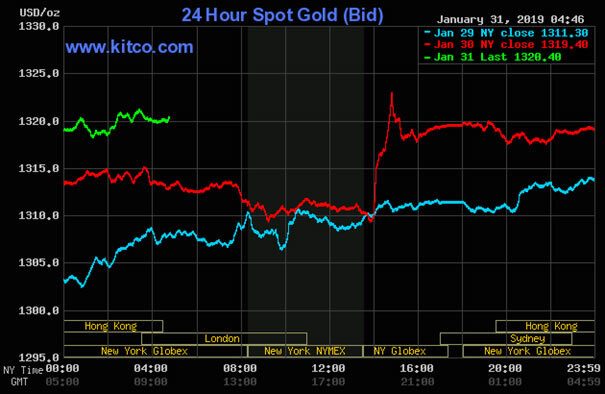 And for gold, as it jumped above $1,320 amid the soft FOMC statement. What’s next? In support of these goals [maximum unemployment and price stability], the Committee decided to maintain the target range for the federal funds rate at 2-1/4 to 2-1/2 percent. That decisions seem to be incomprehensible given “generally strong U.S. macroeconomic performance”, as Powell put it. However, the problem is that the Fed has seen some cross-currents and conflicting signals about the outlook, mainly the slowdown in economic growth in China and Europe, unresolved trade tensions or uncertainty about Brexit. Hence, the growing evidence of cross-currents pushed the Fed to become more patient awaiting greater clarity. In addition, the case for raising rates has weakened somewhat. The traditional case for rate increases is to protect the economy from risks that arise when rates are too low for too long, particularly the risk of too-high inflation. Over the past few months, that risk appears to have diminished. And What About Balance Sheet Normalization? The Committee is prepared to adjust any of the details for completing balance sheet normalization in light of economic and financial developments. Moreover, the Fed announced that it would continue to use administered rates to control the policy rate, with an ample supply of reserves. It means that, as we explained it to our Readers a long time ago, the normalization of the size of the portfolio will be completed sooner, and with a larger balance sheet, than in previous estimates. To sum up, the FOMC was dovish both on the interest rate policy and the balance sheet policy. Although Powell denied that there is a “Powell put”, he said everything what the markets wanted to hear. Or, even more, as the FOMC statements and Chair’s press conference were actually more dovish than expected. 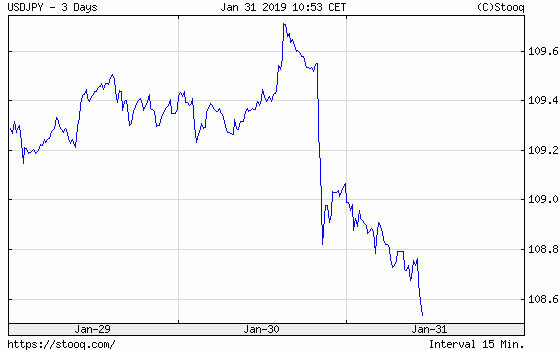 In consequence, the stock markets went up, while the U.S. dollar declined against the euro or the Japanese yen (see the chart below). Chart 1: USD/JPY exchange rate from January 29 to January 31, 2019. So, the price of gold jumped above $1,300 in the response to the dovish signals from the Fed, as one can see in the chart below. Chart 2: Gold prices from January 29 to January 31, 2019. Will it be just a temporary spike or will we see a continuation of the rally? Well, it’s never easy to say, but the addition to the FOMC statement the part about being patient implies that the Fed will not hike interest rates in the next few months at least. It means that the greenback will not be supported by the Fed’s tightening. With weaker US dollar, gold has more room to go up. To be clear: the interest rate hike are still possible in 2019, when the uncertainty clears a bit and all these cross-currents calm. However, a big dovish shift in the Fed’s stance should support the yellow metal for some time (and unless investors, now with Powell’s put at hand, shift into riskier assets).